The treasures of the Pacific Northwest are many indeed and high on that list is the coveted Spring Chinook commonly known as "Springers" here on the Lower Columbia River or King Salmon by neighbors to the North. The Spring Chinook season is well over but just a couple of days before it ended I kiddingly asked my friend, Ed Shrock (a very avid fisherman) when he was going to catch me a "Springer." He not so kiddingly told me to go out and get a license and he would teach me how to catch my own Springer. So I did what he said, and he did what he said. I think Ed realized the good luck value of a beginner. Preparing the fish was the next challenge but fortunately Spring Chinook seems to be almost foolproof due to its high oil content. 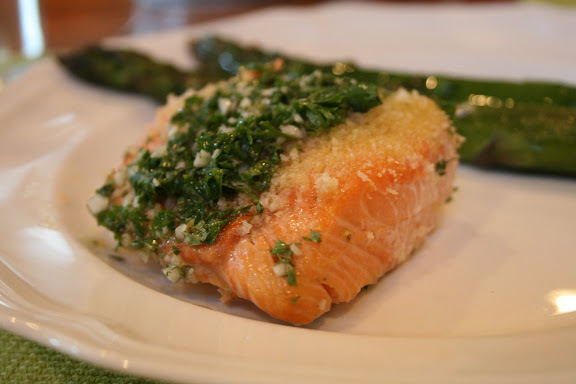 So here is a recipe for Spring Chinook with Salmoriglio Sauce. This Sicilian sauce, known in Sicily as sammurigghiu is a delicious finish for any fish and even a grilled steak. Pour a little vinegar over the fish fillets, then rinse them under cold, running water. Pat the fillets dry with paper towels and arrange them on an ovenproof baking dish. Rub a little salt over the skinless sides of the fillets and sprinkle with the lemon juice. Spread the bread crumbs over the fillets and drizzle them with the olive oil. Cover and let marinate at room temperature for 30 minutes. Preheat the oven to 400°. Bake the fish until just cooked through, about 15-20 minutes. Transfer the fish to a platter. Pour the salmoriglio sauce over the fish fillets and serve. Pour the olive oil into a bowl and slowly whisk in the lemon juice and hot water. Season to taste with salt and pepper and stir in the chopped oregano, parsley and garlic. Warm the sauce slightly and pour over cooked fish or steaks. 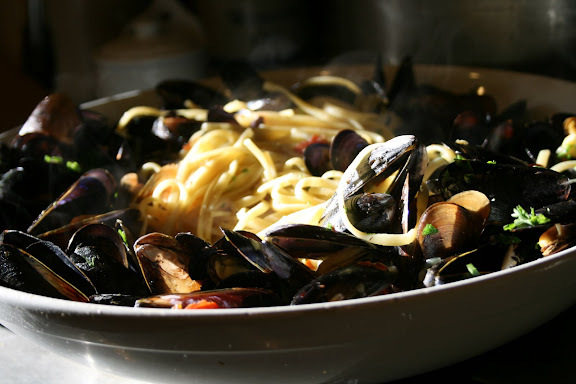 And just for good measure, we preceded this meal with another Northwest treasure, Linguine con Cozze (Linguine with Penn Cove Mussels).